By utilizing patented Cycloidal technology, the Nabtesco RV-E Precision Gearbox combines near zero backlash (less than 1 arc-min), large torque capacity (5X e-stop) and integrated support bearings in one complete positioning package. As a leading manufacturer in the high performance gearing industry, the Nabtesco Cycloidal design provides numerous advantages over competing products in the marketplace. In comparison to Harmonic gearing, the integrated bearings of the RV-E provide superior torsional stiffness, thrust load and overhung moment capacity. The RV-E is also resistant to ‘ratcheting’ or gear slippage, which can occur in high load conditions to Harmonic technology. The Nabtesco gearbox also provides several advantages over traditional planetary gear technologies, specifically in terms of gearbox dimensional thickness and cost for performance. Planetary gearing requires the addition of stages to achieve higher gear ratios, thus adding additional length to the unit. Further, lower backlash planetary models are only typically available at a premium price. However, Nabtesco Cycloidal technology provides ratios from 40:1 up to 250:1 in the same dimensionally compact configuration – and all Nabtesco RV products are shipped with backlash 1 arc-min or lower, as a standard feature. 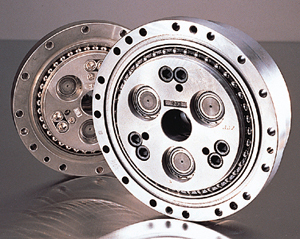 The RV-E gearbox is manufactured by Nabtesco, the world’s largest precision cycloidal gearbox manufacturer. Nabtesco has shipped over 2 million precision gearboxes worldwide and continues to be the preferred choice of design engineers the world over for high performance positioning. Common applications include: motion control devices and medical imaging equipment.